1 of 1 Whisk oil, rice wine, soy, preserves, hot sauce, garlic, ginger, scallions, 1/2 tablespoon of the sesame seeds, and, if using, five-spice powder, in medium-size bowl. 1 of 5 Add chicken and peppers to marinade. Cover; refrigerate 2 hours or overnight. 2 of 5 When ready to serve, prepare Fruited Couscous (recipe on www.familycircle.com). 3 of 5 Prepare outdoor grill with hot coals, or heat gas grill to hot, or heat oven broiler. 4 of 5 Thread chicken on 6 metal skewers, alternating with peppers. 5 of 5 Grill kabobs, turning once, 8 to 12 minutes total, or until cooked through. 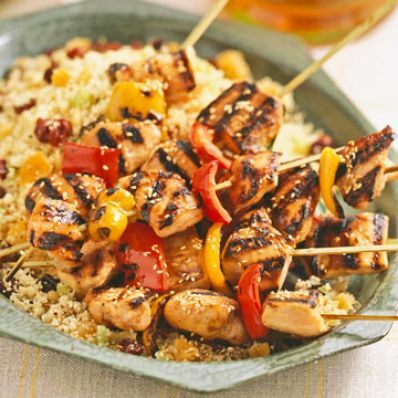 Arrange couscous and kabobs on plates. Sprinkle top with remaining sesame seeds. Per Serving: 192 mg sodium, 1 g fiber, 63 mg chol., 4 g Fat, total, 1 g sat. fat, 150 kcal cal., 5 g carb., 24 g pro.